CIPA Member and author Carol Grever will be reading from her new book at Forza Coffee on Sept 9. Glimpses: A Memoir in Poetry is Carol Grever’s newly released full-length collection of poems. It universalizes the personal experience of distinct lifetime stages, illuminating vivid moments to distill insights. Crisis strikes, bliss surprises, humor heartens, mistakes chasten, and love heals. Forgiveness brings recovery, meditation serenity. 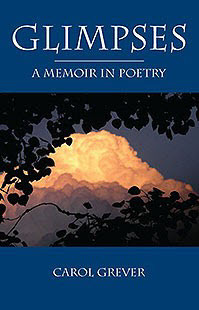 Carol’s poetry has previously appeared in several anthologies. A recognized spokesperson on issues of mixed-orientation relationships, she has also au-thored three nonfiction books and a documentary. She’s been interviewed on radio shows on three continents. She has appeared on network television such as The Oprah Winfrey Show, Anderson Cooper 360, Good Morning America, and The Early Show. Her poetry collection can be found on Amazon.com and BarnesAndNoble.com in paperback, or as an eBook for Kindle or Nook. Her next reading from Glimpses is September 9, 1:00pm at Forza Coffee, 3013 W. 104th Avenue, Westminster.